Li Bai (701-762) - The mid to late Tang Dynasty was characterized by one of the greatest cultural periods in China's history (Recall that the first part of Emperor Xuanzong's reign was considered a golden age - see Li Longji). And the artform which flourished most was poetry. No fewer than a dozen great poets are remembered from this era. However, there are two who are considered more prominent than the rest. They are Li Bai and Du Fu (see below). Two of the greatest poets in all of China's history. They were also contemporaries and friends. Li Bai displayed an uncanny intelligence even from a young age. He read many works on Confucianism and Taoism, as well as many other subjects. He traveled extensively and engaged in a wide range of activities from which he drew inspiration. Foe example, he was known to be a lover of wine and an experienced swordsman. 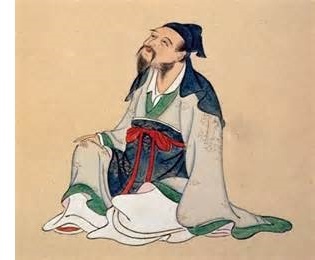 One of his famous poems is called "Waking from Drunkenness on a Spring Day", and by the age of 20, was thought to have already killed several men in accordance with a tradition called youxia. An autobiographical quote by him which survives states, "When I was fifteen, I was fond of swordplay, and with that art I challenged quite a few great men." His travels led him to write many poems on nature. It also turned him into a celebrity. And his celebrity brought him to the attention of the emperor (Xuanzong). He invited Li Bai to his court where he became a friend and an adviser. However, his propensity for drinking often led to turmoil amongst other members of the court, and after two years he was dismissed. So he went wandering again. It was about this time that he officially became a Taoist. In 744 he and Du Fu met. A dozen of Du Fu's poems about Li Bai survive, but only one of Li Bai's about Du Fu does. He was invited back to serve in the new emperor's court in 762, but died before news of the offer reached him. The romantic version of his death is that he drown while reaching from his boat for the moonlight reflecting off the water. As a lover of wine, it was quite possible he was drunk at the time. About 1000 of his poems survive.